Common Name: Pseudostellaria root, False starwort root. Source of Earliest Record: Zhongguo Yaoyong Zhiwu Zhi. Radix Pseudostellariae is produced mainly in the provinces of Jiangsu, Anhui, and Shandong. It is collected in summer and dried in sunlight. After the small rootlets are removed, the tuber is used unprepared. Properties & Taste: Sweet, slightly bitter and neutral. 1. Deficiency of the spleen manifested as poor appetite and lassitude. Pseudostellaria root (Taizishen) is used with Dioscorea (Shanyao), Hyacinth bean (Biandou), Germinated millet (Guya) and Germinated barley (Maiya). 2. Deficient yin of the lungs manifested as dry cough or cough with scanty sputum. 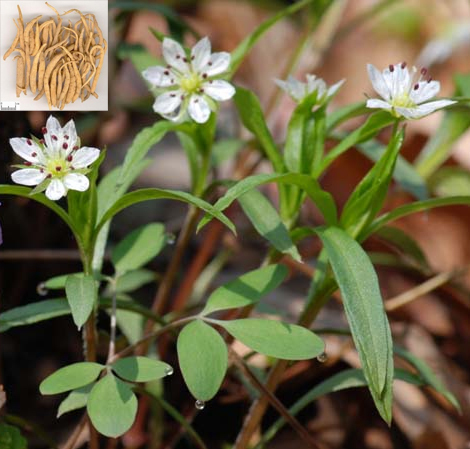 Pseudostellaria root (Taizishen) is used with Glehnia root (Shashen) and Ophiopogon root (Maidong). 3. Deficient yin of the stomach manifested as thirst. Pseudostellaria root (Taizishen) is used with Dendrobium (Shihu) and Trichosanthes root (Tianhuafen). 4. Deficiency of the spleen leading to deficiency of both qi and blood manifested as palpitations, insomnia and sweating. Pseudostellaria root (Taizishen) is used with Wild jujube seed (Suanzaoren) and Schisandra fruit (Wuweizi). Dosage: 10-30 g, decocted in water for an oral dose.